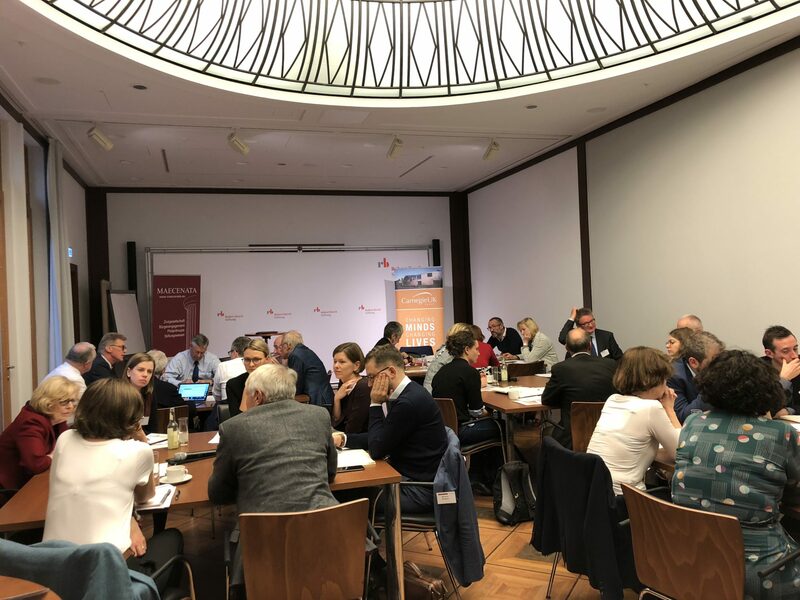 This October, the Carnegie UK Trust and the Maecenata Stiftung brought together civil society representatives from the UK and Germany to debate the role of our sector in responding to the major challenges and changes in society. Naturally given the conference title, we talked a lot about the future relationship of Britain and Germany. Notwithstanding the uncertainty about the shape and potential constraints of the formal relationship the UK will have to Germany once it is a third country outside the EU, we focused on strategies for delivering the most effective future cooperation between civil society organisations. Given the sense of unprecedented political upheaval and the bandwidth this uses up among political actors, we asked how our organisations could support serious discussion about our major future challenges – such as aging populations, the digitalisation of society, rising inequality, and developing progressive responses to migration. We tried thinking 10 years in the future, to help frame a more constructive conversation looking beyond the immediate political fray. This proved challenging however, with participants asking: Will there be an EU in 10 years’ time? Will there be a UK in 10 years’ time? If so, what will these entities look like? There was a real sense of deepening divisions, with the nations of the UK voting differently on Brexit and calling for different future arrangements with the EU, and the EU itself facing a range of existential challenges (from resolving the structural problems of the Eurozone to discordant East-West and North-South relationships between Member States) in addition to Brexit. Germany is not immune to the political instability, with growing support for the political parties on the far right and left – notably the Alternative for Germany – leading to severe difficulties in forming a government after the last election, and to a widespread sense of legislative paralysis (days after our conference ended, the Chancellor Angela Merkel announced her plans to step down as party leader at the end of the year). Civil society was imagined as the space for citizens to organise and connect; civil society organisations themselves as interlocutors occupying a (not always comfortable) space between political decision makers, the state and individual citizens. There was a sense that in many instances civil society has been too timid in ‘speaking truth to power,’ for fear of crossing the boundaries into political activity (something which is strictly regulated) or deepening widespread citizen distrust in institutions by being perceived as having a political bias. Participants asked if we need to have much more thoughtful and deliberate strategies about when and how to focus on advocacy versus research or grant-making activities? In order to speak truth to power, civil society organisations need to know what’s happening in their communities. Some participants felt that civil society organisations have made themselves vulnerable to the charge of being overly technocratic, elitist or self-serving; or of having co-opted the language of government to an extent which alienates citizens. There was a strong feeling that civil society organisations have not been responsive or reflective enough of the communities they seek to serve. It was pointed out how few in the sector expected the outcome of the Brexit referendum, or know now how to respond to the public discontent supporting the rise of political populism. Through our ‘ten years on’ lens, participants wondered if the UK might wish to re-join the EU at some point in the future – if we should approach Brexit not as a definitive rupture but as part of an ongoing realignment. What seems clear is that the goal of European (re)integration will struggle with low levels of consent from citizens, unless the value of that direction of travel becomes more immediately obvious to communities who currently feel it does not serve their needs. Participants had practical suggestions to support this, including pushing for genuine diversity of genders, ethnicities / nationalities and social backgrounds in our organisations as ‘mission critical’ for understanding the plurality of views in society, and co-decision models of funding with the active participation of service users / grantees. We talked about the ‘shrinking space’ in public life, linked to the atomisation and digitalisation of society whereby people do not socialise and relate in the same way in the public realm as (perhaps) they used to. Participants pointed out that if people are increasingly connecting in the digital realm, via social media and digital platforms, then civil society organisations need to ‘go where the people are’ and get better at maximising these digital platforms to support associative life. How can we do this while seeking to we mitigate the detriments we are increasingly feeling from digitalisation – i.e. people becoming more isolated in the ‘real world,’ the extent of online emotional abuse, and the lack of accountability / traceability which is one of the drivers of this behaviours? Does civil society have a role in improving the civic space online, contributing to a better quality of online debate? The space for civil society in both the UK and Germany is diverse, fragmented, comprised of organisations with very different structures, capacities and missions. This diversity is, of course, core to the healthy functioning of civil society and democracy. But a key question of the conference was how can we (both within and between the UK and Germany) collaborate more to help tackle some of our biggest shared social challenges?